Haemodynamic instability (HR>110bpm; systolic blood pressure (SBP)<100 mm Hg; requirement for inotropes and critical care; requirement for thrombolysis or embolectomy). Oxygen saturations < 90% on air. Active bleeding or risk of major bleeding (eg. recent gastrointestinal (GI) bleed or surgery, previous intracranial bleeding, uncontrolled hypertension). On full-dose anticoagulation at the time of the PE. Severe pain (eg. requiring opiates). Other medical comorbidities requiring hospital admission. Chronic kidney disease (CKD) stages 4 or 5 (estimated glomerular filtration rate (eGFR)<30 mL/min) or severe liver disease. Heparin-induced thrombocytopenia (HIT) within the last year and where there is no alternative to repeating heparin treatment. Social reasons which may include inability to return home, inadequate care at home, lack of telephone communication, concerns over compliance, etc. In the context of low-risk PE and an incidental finding of elevated troponin, senior review is required and alternative causes for troponin release should be considered. Using a single direct oral anticoagulant (DOAC) in a pathway is preferred to minimise potential confusion over dosing and administration. Those with PESI-48 class III or sPESI-48 score of >0 are considered to be at higher risk of adverse outcome and senior review is necessary prior to discharge; PESI and sPESI may remain elevated due to non-reversible factors (eg, cancer, age) which should be taken into consideration when using clinical judgement. Consideration should be given to repeating assessment of RV function with echocardiography or biomarkers in those admitted with RV dysfunction or biomarker elevation at baseline. Patients with confirmed or suspected PE should be reviewed by a consultant prior to discharge on an OP PE pathway. If no consultant is available, then patients may be reviewed by a senior trainee (ST3 or above; ST4 in the case of Emergency Medicine) by a staff grade or similar substantive career grade doctor, advanced nurse practitioner or clinical nurse specialist designated to undertake this role within the department with consultant advice available. Consider initial assessment of provoking risk factors for the index PE at an early stage, for example, immobility, surgery, cancer, intercurrent illness, etc, since this will determine duration of anticoagulation. Screening policies for malignancy are out of scope for this guideline, but when screening investigations are performed, a mechanism should be in place to review results within a prompt time frame. Follow-up of PE should be performed by clinicians with a special interest in venous thromboembolism (VTE). All pregnant and postpartum women presenting with suspected PE or confirmed PE should be reviewed by a consultant and discussed with maternity services prior to discharge. OP care pathways may be considered for suspected or confirmed PE in pregnancy and/or the postpartum period. Clinical risk scores derived for non-pregnant patients, such as PESI/sPESI, should not be used in pregnant women. DOACs or vitamin K antagonists (VKAs) should not be used in pregnant patients with suspected or proven PE. Patients with active cancer should be reviewed by a consultant prior to discharge given the higher risk of 30-day mortality. Patients with incidental PE should be managed in the same way with respect to OP management as those with symptomatic PE. Intravenous drug abusers with suspected PE should be admitted for further investigation and management. Succinct written information should be provided to the patient on discharge, using non-technical language and including telephone numbers/email addresses for advice on dealing with any subsequent changes in the patient’s condition. An example, from Sheffield Teaching Hospitals, is included in online supplementary web appendix 3. The information material produced by the thrombosis charity Thrombosis UK (www.thrombosisuk.org) may also prove helpful. The British Thoracic Society (BTS) Guideline for the initial OP management of PE provides guidance on how to risk-stratify patients with suspected and confirmed PE and subsequently manage them in an OP or ambulatory care setting. Over the last 10 years there has been an increasing drive to manage many conditions traditionally treated during an IP admission as OPs. This has become widespread practice in managing deep vein thrombosis (DVT) and data are increasing to support this strategy in PE. With the licensing of the DOACs for the treatment of acute PE which do not require a LMWH run-in or International Normalised Ratio (INR) monitoring, OP management of suspected PE has become more straightforward. This is clearly an opportunity to improve patient experience and reduce hospital length of stay (LOS), but it also presents a risk if the wrong patients are identified for OP management. Finally, the advent of the DOACs facilitates early discharge from hospital since patients no longer need to be kept in hospital until they have reached a therapeutic INR. This raises the question of how to identify moderate-risk patients appropriate for early discharge. In conclusion, there is a need for a standardised approach to identify low-risk patients for OP management and also to aid clinicians in deciding when moderate-risk patients can be discharged early. The aim of this guideline is to standardise the approach to the initial OP management of PE (up to 3 weeks post diagnosis) and to reduce the risk to patients and hospital trusts, while ensuring best value to the National Health Service. This guideline is aimed at clinicians, in particular physicians, clinical nurse specialists and advanced nurse practitioners, at all levels of seniority delivering emergency, acute, ambulatory and IP care who are involved in the management of acute PE. The main specialties referring to the guidance are likely to be acute, emergency, general (internal) and respiratory medicine. It is also designed to inform general practitioners involved in the delivery of ambulatory care or thrombosis pathways. This document may also be used by healthcare commissioners and hospital management to ensure appropriate staffing and resourcing of ambulatory care facilities to integrate PE management into ambulatory care pathways. Adults (≥16 years) with suspected and confirmed acute PE. Use of DOACs in relation to suspected PE and OP management. Special subgroups of patients (pregnant patients, those with cancer and intravenous drug abusers). 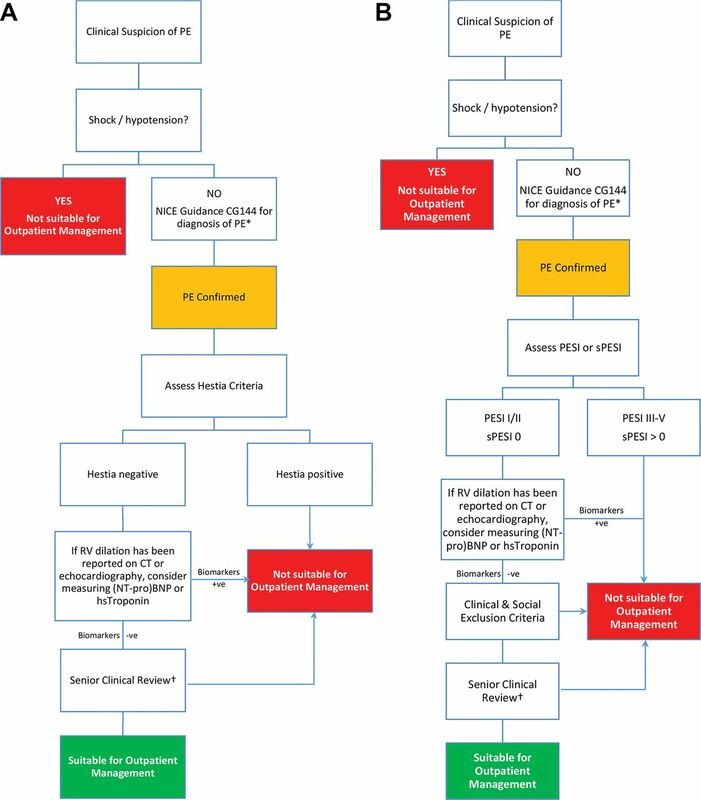 The diagnostic algorithm for PE. Detailed comparisons of anticoagulant drugs. Who should be treated and not treated, specifically how to manage subsegmental PE. Duration of anticoagulation and thrombophilia investigations. This guideline is based on the best available evidence. The methodology used to write the guideline adheres strictly to the criteria as set by the AGREE II collaboration, which is available online at www.agreetrust.org/resource-centre/agree-ii/. The BTS Standards of Care Committee (SOCC) guideline production manual is available at www.brit-thoracic.org.uk/guidelines-and-quality-standards/. Clinical questions were structured in the Population, Intervention, Control, Outcome format (see online supplementary web appendix 1), to define the scope of the guideline and inform the literature search. Systematic electronic database searches were conducted in order to identify potentially relevant studies for inclusion in the guideline. For each topic area the following databases were searched: Ovid MEDLINE (including MEDLINE In Process), Ovid EMBASE and the Cochrane Library (including the Cochrane Database of Systematic Reviews and the Database of Abstracts of Reviews of Effects) from 1980. The searches were first run in July 2014 and updated in October 2015 (see online supplementary web appendix 1 for search strategy). Searches included a combination of indexed terms and free text terms and were limited to English-language publications only. The initial search identified 2385 potential abstracts and the second search 432 other abstracts. Abstracts were not rejected on the basis of the journal of publication, the country in which the research was performed or published or the date of publication. The screened abstracts were allocated to the relevant section(s) of the guideline and two group members allocated to each of those sections. The full paper was obtained for all relevant or possibly relevant abstracts. The first screening process identified 153 of the initial 2385 reference abstracts to be definitely or possibly relevant to the guideline. Two guideline reviewers per section independently reviewed the abstracts to identify papers to be appraised for the guideline. The two reviewers for each section then independently appraised each paper assigned to them using the Scottish Intercollegiate Guidelines Network (SIGN) critical appraisal checklists. The reliability of the evidence in each individual study was graded using the SIGN critical appraisal checklists and is shown in the evidence tables (++, + or –). The body of evidence for each recommendation was summarised into evidence statements and graded using the SIGN grading system (see table 1). Disagreements were resolved by discussion with the section partner. The second literature search in October 2015 yielded 432 abstracts. Of these, 13 were identified as definitely or possibly relevant to the guideline. However, all of the pertinent ones from this search had been identified by the Guideline Development Group (GDG) in the meantime and already incorporated. Recommendations were graded from A to D, as indicated by the strength of the evidence, as in table 2. In line with SIGN guidance, evidence appraised as ‘minus’ was considered in context but in the absence of other supporting evidence appraised as ‘plus’, it was discussed among the GDG regarding that point and any recommendation hence made was Grade D. Important practical points currently lacking any research evidence and assessed as unlikely to have research evidence in the future were highlighted as ‘good practice points’ (GPP). The GDG corresponded regularly by email, and meetings of the full group were held in April and October 2014, March, May and October 2015, and January 2016 as well as a number of teleconferences. The BTS SOCC reviewed the draft guideline in March 2016. The draft guideline was made available online in January/February 2017 for public consultation and circulated to all the relevant stakeholders. The BTS SOCC re-reviewed the revised draft guideline in June 2017 and final SOCC approval was granted in December 2017. This BTS Guideline will be reviewed within 5 years of publication. Dr Vincent Connolly represented the Society for Acute Medicine; Dr Chris Davies represented the Royal College of Physicians, London; Dr Daniel Horner and Dr Laura Hunter represented the Royal College of Emergency Medicine; Ms Wendy Preston represented the Association of Respiratory Nurse Specialists; Dr Campbell Tait represented the British Committee for Standards in Haematology. Suspected PE is a common cause of presentation to hospital and ranges in severity from small emboli with few or no symptoms through to massive, life-threatening PE. Over the last decade there has been an attempt to characterise a group of low-risk patients who may be able to receive treatment for their PE outside of a traditional IP setting. Studies have sought to identify the proportion of patients who may be considered low risk. The figures range from 37% to 44% of patients with confirmed PE who may be considered suitable for home treatment.6 7 In a UK population where the overall incidence of PE is considered to be 60–70 cases/100 000 population, there will be a considerable number of patients who are suitable for OP therapy, even at the lower ranges of reported suitability. There are two randomised controlled trials (RCTs), two meta-analyses and several cohort studies that have explored the outcomes associated with OP management of PE. Comparison of the studies is complicated by the differences in selection criteria and, in some cases, a lack of clarity about what constituted OP or home management of PE. In the largest RCT, Aujesky et al8 randomised 344 low-risk patients (PESI categories I and II) with confirmed PE, without predefined exclusion criteria based on clinical and social factors, to either IP treatment (n=172) or OP treatment (n=172) with LMWH and VKA as the method of anticoagulation. The trial was designed as a non-inferiority study and the sample size was calculated with 80% power to detect non-inferiority at a margin of 4% with a one-sided α of 0.05, based on an estimated recurrence rate of VTE of 0.9%. A non-inferiority margin of 4% would test that the true recurrence rates in the OP arm would not exceed the IP arm by >4%. The study took place in 19 emergency departments in Switzerland, France, Belgium and the USA. The investigators showed non-inferior outcomes for recurrent VTE at 14 and 90 days with no recurrences in either group at 14 days and one recurrence (0.6%) at 90 days in the OP group (95% upper confidence limit 2.7%; p=0.011). At 14 days, major bleeding outcomes were non-inferior in the OP group with two intramuscular bleeds compared with none in the IP group (95% upper confidence limit 3.6%; p=0.031). By 90 days, since one patient in the OP group had developed abnormal uterine bleeding, the non-inferiority threshold was exceeded (95% upper confidence limit 4.5%; p=0.086). There was no difference in mortality (one death in each arm). OP treatment required a longer duration of LMWH (mean of 11.5 days vs 8.9 days) before therapeutic INR levels were achieved. Patients were well-matched between the two groups. In the other RCT by Otero et al,1 132 low-risk patients with acute symptomatic PE were randomised to early discharge (n=72) or standard hospitalisation (n=60). The statistical methods and analysis were similar to the above study, assuming a 1% early complication rate (deaths, thromboembolic recurrences and bleeding), although the sample size was calculated with 80% power and a two-sided α of 0.05; the margin for non-inferiority was not specified. Early discharge was defined as after 3 days of admission if a transthoracic echo had excluded right heart strain or after 5 days of admission if an echocardiogram could not be performed. They used a non-validated risk score developed in 2007 by Uresandi et al,9 comprising a number of clinical and social exclusion criteria, to identify a low-risk group; however, this only identified 13% of those who were diagnosed with PE as suitable for home treatment, so was overly selective. The trial found no difference in the rates of recurrent VTE (2.8% early discharge vs 3.3% hospitalised) or significant bleeding (1.4% vs 1.6%) between the groups, but was terminated early due to an unexpectedly high death rate. Overall mortality was 4.2% (95% CI 0.5% to 8.9%) in the early discharge group and 8.3% (95% CI 1.1% to 15%) in the standard hospitalisation group. Short-term mortality was 2.8% (95% CI 0.8% to 9.6%) in the early discharge group compared with 0% in the standard hospitalisation group. There have been two meta-analyses which have attempted to combine the findings from these RCTs and other cohort studies, although as expected largely based on the same studies.10 11 There were significant challenges as the studies had differing methods for categorising a low-risk population and defining OP treatment or early discharge from hospital. In terms of mortality, in the meta-analysis undertaken by Zondag et al, there were 49 reported deaths in those treated as an OP (1.9%). None of these were due to fatal PE. In the IP group, there were eight deaths (0.74%). The pooled incidences did not differ significantly between the groups, and after excluding studies which had over-representation of patients with malignancy (>15% of the study population), the pooled incidence of mortality in the OP group decreased to 0.6%.5 Piran et al11 reported a pooled overall mortality rate of 1.58% in the OP and early discharge group. The lack of a control group makes comparison difficult. However, these outcomes were comparable to the outcomes of low-risk patients treated in hospital in the RCTs included in this meta-analysis. The only RCT to report on LOS was that of Aujesky et al.8 Ninety-five per cent of patients in the OP arm were managed entirely as OPs, with a mean LOS of 0.5 days from randomisation compared with 3.9 days in the IP arm.8 There was no significant difference between the two groups in terms of other healthcare utilisation (hospital readmissions, emergency department visits and OP visits to a doctor’s office within 90 days). The only difference between the groups was a higher number of home nursing visits for LMWH administration, as expected, in those treated as OPs compared with the IP group (348 vs 105 visits). There are two other UK studies which have reported data on LOS. Davies et al7 studied 157 patients with confirmed PE who were discharged early from hospital on LMWH. The median time to diagnosis was 1.0 (range 0–3; 95% CI 0 to 1) days. The length of hospital stay was 1.0 (0–3) days, distributed as follows: 0–24 hours: 91 (58.0%); 24–48 hours: 33 (21.0%); and 48–72 hours: 33 (21.0%). The total length of OP treatment (bed-days saved) for all patients was 990 days. A prospective cohort study described the impact of investigating and managing low-risk patients with suspected PE in the OP setting over a 2-year period. Of the 971 patients referred, 871 were treated entirely as OPs (89.7%).12 The authors report previous pilot work suggesting this cohort of patients previously had a mean LOS of 1.59 days, resulting in 692 saved bed-days per year. Three studies addressed patient satisfaction. There was a lack of consistency in the scoring system used. Those studies which did report patient satisfaction reported favourable scores for OP management. In the RCT by Aujesky et al,8 156/170 OPs (92%) and 158/167 IPs (95%) were reported to be satisfied or very satisfied with their treatment site. There was no statistical significance between these groups. Of note, 14% of the patients treated at home expressed that they would have preferred to remain in hospital for longer. In total, 124 of the 157 patients (79%) who were discharged early following confirmation of PE completed a satisfaction score in the study by Davies et al.7 Of these, 81 (65.3%) gave a score of 10, indicating that the majority of patients were highly satisfied with OP management. Of the 149 (94.9%) patients expressing a preference, 144 (96.6%) indicated that they would prefer to receive treatment for a subsequent PE as an OP. Agterof et al reported satisfaction and anxiety scores in a cohort of low-risk patients discharged immediately or within 24 hours of PE diagnosis.13 The satisfaction score (PSQ-18) was returned on day 10 by 103/152 patients (67.8%). The mean score for satisfaction with out-of-hospital treatment was 3.8. An anxiety score (HADS-A) was completed at days 0 and 10 by 101 patients (67.1%). There was no difference in the mean score on day 0 compared with day 10 (4.29 vs 4.31). There is no evidence for improved patient satisfaction with OP versus IP care. Research is required to enhance the evidence base regarding patient experience and cost effectiveness. Accurate risk stratification and identification of those at low risk of morbidity and mortality following a diagnosis of PE can influence management strategies and facilitate OP management or early discharge in those deemed appropriate. This section reviews the evidence surrounding validated risk stratification tools and clinical inclusion and exclusion criteria to OP management following confirmed PE. Thirty-four studies were identified that evaluated clinical inclusion or exclusion criteria or derived and/or validated risk prediction tools associated with outcome from PE. The majority of these were retrospective or prospective cohort studies with only two RCTs and three meta-analyses. Only one study was conducted and validated in a UK population; however, the majority were from European or North American populations and the data are, therefore, likely to be representative of patients managed in the UK, accepting that there are some differences in care set-up between countries. Studies using clinical risk scores (n=22), including randomised trials of OP versus IP management (n=2). Studies using clinical exclusion criteria (n=9). There are several studies both deriving and validating various prediction scores. The most frequently used and most validated scores are the PESI score, Geneva score and sPESI score. A variety of scores have added additional biochemical or radiological investigations to the validated scoring systems to try to refine them further. The studies are summarised in appendices2 and 3. These scores, although used latterly to select patients for OP management, have originally been derived to predict 30-day mortality rather than as specific tools to guide decisions regarding selection of patients for OP management. Aujesky et al14 derived and validated the PESI using a cohort of 15 752 patients with confirmed PE. The score comprises independent predictors of 30-day mortality and is summarised in table 3. Patients with PESI class I (very low risk) and PESI class II (low risk) had a 30-day mortality of ≤1.6% and 3.6%, respectively. No patients in these classes suffered recurrent VTE or major bleeding during the follow-up period. The score also performed well in internal and external validation with area under the receiver operating characteristic curve (AUC) of 0.77 (95% CI 0.75 to 0.79). sPESI was derived by Jiménez et al18 and externally validated using data from a large international registry (Registro Informatizado de la Enfermedad TromboEmbólica (RIETE)). The score consists of six variables which are listed in table 4. A score of zero is classified as low risk. The original PESI was also applied to the sPESI derivation cohort to provide a comparison with a well-validated score. The sPESI was shown to be non-inferior to the PESI in predicting 30-day mortality. sPESI classified 30.7% of patients as low risk in the derivation cohort and 36.2% of patients in the validation cohort as low risk compared with 36.3% using the PESI. Thirty-day mortality in these low-risk groups were 1.0% (95% CI 0.69 to 0.80) and 1.1% (95% CI 0.7% to 1.5%), respectively. There was a low incidence of major bleeding and recurrent VTE in those classified as low risk by sPESI of ≤1.5% at 30 days in both the derivation and validation groups. The Geneva score, derived in 2000, uses a combination of clinical and subjective criteria with weighting towards cancer and heart failure. The score also requires the use of leg ultrasound (USS) to identify DVT and may not be readily applicable to a UK-based system of investigation for PE. The original derivation was performed by Wicki et al19 and identified six features as predictive of mortality, recurrent VTE or bleeding at 90 days. The Geneva score is summarised in table 5. Of 296 patients, 67.2% were deemed to be low risk using the Geneva score, with 2.2% 90-day mortality. The Geneva score was validated by Nendaz et al20 In their cohort , the Geneva score identified 79.9% of patients as low risk (score ≤2), with 5% (95% CI 2.6 to 9.6%) experiencing an adverse event within the first 90 days (defined as death, major bleed or recurrent VTE). The model appeared to show good discriminative ability in this population to predict 9 0 - day adverse events (AUC 0.77 (95% CI 0.65 to 0.89)). Most of the scores discussed above evaluate outcomes at 30 days, yet it may be more relevant to consider systems which risk-stratify patients for early adverse events when integrating into OP pathways. Maestre et al26 used an international registry of 18 707 patients with PE (RIETE) to derive a new score to examine 10-day composite outcome of recurrent PE, major bleeding or death. This score (RIETE score) was compared with PESI and sPESI. The RIETE score comprised 11 independent predictors, which included some markers of comorbidity, cardiovascular instability and hypoxia. RIETE classified as low risk more patients than PESI but fewer than sPESI (24%, 17% and 35%, respectively). Area under the ROC curve was similar for all three scores, although in internal validation the RIETE score did show slightly greater discrimination. The authors conclude that this score requires further external validation. Erkens et al27 used a Canadian dataset to validate and compare PESI and sPESI. In their cohort, 48.6% (95% CI 42.1% to 55%) of patients were deemed low risk using the PESI (class I or II) and 33.3% (95% CI 27.4% to 39.6%) were identified as low risk using sPESI. The low-risk patients had 0% 90-day mortality, with no adverse events (bleeding or recurrent VTE) within the first 14 days. Jiménez et al28 aimed to validate and compare the PESI with the Geneva score in a cohort of 599 patients. The end points were mortality, major bleeding and recurrent VTE at 30 days. The PESI classified substantially fewer patients as low risk (class I and II) compared with the Geneva score (36%; 95% CI 32% to 40% vs 84%; 95% CI 81% to 87%). There was no significant difference between the low-risk PESI and Geneva groups in terms of bleeding or recurrent VTE; however, there was a marked and significant difference in 30-day mortality between the two groups identified as low risk. PESI class I and II had 0.9% (95% CI 0.3% to 2.2%) mortality, with the Geneva low-risk group mortality much higher at 5.6% (95% CI 3.6% to 7.6%). When the discriminatory power of the scores was assessed by means of ROC curve the PESI showed much better discriminatory ability (AUC 0.76 (95% CI 0.69 to 0.83) and 0.61 (95% CI 0.51 to 0.71), respectively). This suggests that PESI is better at identifying those patients at low risk of 30-day mortality than the Geneva score. Kabrhel et al29 studied the features which predicted clinical deterioration and need for intervention within the first five days after diagnosis of PE and also 30-day, all-cause mortality. The features which were found to be independent predictors included SBP <90 mm Hg, arterial saturations<90%, coronary artery disease, residual DVT and right heart strain on echocardiography. Active malignancy and heart failure were associated with increased 30-day mortality. The authors also validated PESI, sPESI and Geneva scores for a variety of outcomes, including a composite outcome that included mortality, use of vasopressors, dysrhythmia and need for ventilation among others parameters. The more comparable AUC calculation for 30-day mortality for PESI was 0.84, sPESI 0.82 and Geneva 0.78 and these scores showed high sensitivity for 30-day mortality. The authors concluded that, in their cohort, 66% of patients suffered no clinical deterioration and had no need for intervention in the initial five days after diagnosis and would thus be deemed suitable for OP management. Several studies have derived a number of clinical criteria for which discharge as an OP is considered inappropriate. These included obvious variables indicating serious or potentially life-threatening PE, such as the need for thrombolysis or the need for inotropes and intensive care unit support. Early studies, before prediction scores, used variables such as hypoxaemia and hypotension, pain requiring analgesia, bleeding or high risk of bleeding and subjective criteria allowing exclusion if required to stay for a medical reason or likely poor compliance or social factors. The ‘Hestia’ criteria have been the most widely used and are presented in table 6 alongside the only criteria to have been derived from a UK population. The only tool derived and validated in the UK was developed by Davies et al7 in 2007. It comprises a series of eight clinical exclusion criteria which are also summarised in table 6. In the derivation study, 43.6% of patients were deemed suitable for OP management using these criteria. During the 90-day follow-up, 4.5% died, with bleeding (both major and minor) occurring in 5% and recurrent VTE in 3%. Application of these criteria to the validation cohort seemed to identify a population with low risk of adverse events at 90 days (recurrent VTE 0% (95% CI 0.0% to 2.3%); major bleeding 0% (95% CI 0.00% to 2.3%) and death 1.9% (95% CI 0.4% to 5.5%)). Many other investigators have used very similar criteria with similar findings,33–35 although one study by Elf et al6 included the extent of perfusion defect on VQ scan, making it impractical for use in the UK presently. These are presented in appendices 2 and 3. Although the randomised controlled study by Aujesky et al8 used PESI to identify low-risk patients, they also applied bespoke exclusion criteria (Box 1), many of which appear to overlap with criteria in PESI and also bear many similarities with the Hestia criteria. Zondag et al36 compared the Hestia criteria with sPESI for 30-day mortality by conducting a post-hoc analysis on the original Hestia derivation dataset. Of 468 patients in whom sPESI could be calculated, 53% were identified as suitable for OP management by Hestia criteria, with 59% deemed low risk according to sPESI. Although both tools selected slightly different patients as low risk, they had similar outcomes, with 30-day adverse events (major bleeding, recurrent VTE or death) of 2.4% in the Hestia group and 2.2% in the sPESI low-risk patients. sPESI performed slightly better than Hestia in testing (AUC 0.756 (95% CI 0.642 to 0.871) vs 0.679 (95% CI 0.536 to 0.822), respectively). A further post-hoc analysis in 2013 compared the Hestia derivation cohort with ESC criteria (shock, PESI/sPESI, RV impairment on imaging, biomarkers) for predicting 90-day adverse events.37 Both the Hestia criteria and European Society of Cardiology (ESC) criteria identified over half of the patients as low risk and potentially suitable for OP management (55% and 54%, respectively). Again, although they selected a slightly different patient group as suitable for OP management, their negative predictive value (NPV) for adverse events was very similar (100% for Hestia and 99% for ESC score). Vali et al12 used a modified version of the PESI in combination with a series of clinical exclusion criteria (pulse <110 bpm, SBP >100 mm Hg, oxygen saturations >92% on air, respiratory rate <30 bpm, no syncope, normal troponin, no large central clot or right heart strain on CTPA, no compliance or follow-up issues, low risk of bleeding, did not require admission for other comorbid conditions) to identify patients with suspected PE who were suitable for OP management. Using these criteria they managed 72.9% of patients with confirmed PE as OPs with PE-specific mortality of 0%. There are three meta-analyses which broadly draw the same conclusions. Squizzato et al38 looked at 33 studies comprising 35 518 patients and compared clinical prediction tools for complications following treatment of low-risk PE. The authors excluded any prediction tools which incorporated markers of RV dysfunction which required invasive investigation (eg, systolic pulmonary artery pressure). There was a pooled mortality at 30 days of 1.7%, at 14 days of 0.7% and at 90 days of 2.2%. Non-fatal recurrent VTE and major bleeding at 14, 30 and 90 days, respectively, were 0.8%, 1.8% and 2.3%. The meta-analysis concluded that clinical prediction tools can be used to safely identify patients with acute PE at low risk of complications. Zondag et al10 looked at low-risk patients managed as OPs (<24 hours; n=1657), early discharge (ED) (<72 hours; n=256) or IPs (n=383) and compared outcomes. Results showed a low pooled incidence of recurrent VTE (1.7%, 1.1% and 1.2%, respectively, OP, ED and IP), low pooled major bleeding (0.97%, 0.78% and1.0%, respectively) and low pooled mortality (1.9%, 2.3% and 0.74%). This suggests that low-risk patients can be managed as safely in the OP setting as following early discharge from the IP setting. Piran et al11 also assessed pooled data on 1258 patients in eight prospective cohorts and RCTs looking at OP treatment and early discharge (1–3 days), showing pooled event rates at 3 months. Overall mortality was 1.58%, recurrent VTE rates 1.47%, fatal PE 0.047% and major bleeding 0.81%. Clinical and risk stratification models appear effectively to risk-stratify low-risk patients who would be suitable for OP management for acute PE. Historically patients with confirmed PE are initially treated with anticoagulants in a hospital setting to avoid potential complications including major bleeding. Major bleeding is defined according to the ISTH criteria: (i) fatal bleeding and/or (ii) symptomatic bleeding in a critical area or organ, such as intracranial, intraspinal, intraocular, retroperitoneal, intra-articular or pericardial, or intramuscular with compartment syndrome and/or (iii) bleeding causing a fall in haemoglobin level of 20 g/L or more or leading to transfusion of two or more units of whole blood or red cells. The RIETE investigators have derived and validated a score in patients with documented VTE to predict the risk of major bleeding within 3 months of anticoagulant therapy.40 On multivariate analysis, age >75 years, recent bleeding, cancer, creatinine levels >1.2 mg/dL, anaemia or PE itself were independently associated with an increased risk of major bleeding. The same registry was used to derive a scoring system for early adverse outcomes (the composite outcome included all-cause mortality, recurrent PE and major bleeding) within 10 days of acute PE.26 Within the 18 707 cohort, of whom 95.1% had been managed as IPs, major bleeding was reported in 203 (1.09%). A low RIETE score, defined as having none of the nine characteristics associated with an increased risk of the composite outcome, was associated with a low bleed rate (0.2%) which was lower than patients with a low sPESI (0.48%), but no different from those with a very low PESI (0.31%). Other scoring systems, for example, HASBLED, have been largely developed and validated in AF cohorts. In a retrospective study of 223 patients with PE and 314 with DVT who were commenced on VKA between 2006 and 2007 in three hospitals in the Netherlands, the HASBLED score was used to estimate the risk of major bleeding within 180 days.41 Cumulative incidences of major bleeds were 1.3% (95% CI 0.1 to 2.5) in the non-high risk group (HASBLED <3) and 9.6% (95% CI 2.2 to 17.0) in the high-risk group (HASBLED ≥3) (p<0.0001 by log-rank test), with an HR of 8.7 (95% CI 2.7 to 28.4). Abnormal renal function (HR 10.8, 95% CI 1.9 to 61.7) and a history of bleeding events (HR 10.4, 95% CI 2.5 to 42.5) were independent predictors of major bleeds during follow-up. However, 388 of the 537 patients had missing variable(s) and the median time to a major bleed was 61 days (min 6, max 148 days). Klok et al42 externally validated and compared the predictive value of the HEMORR2HAGES, HASBLED and ATRIA scores to the Kuijer and RIETE scores for the occurrence of major bleeding complications over a 30-day period in 448 consecutive patients with PE treated with a VKA. Most bleeding events (16/20) occurred in the first seven days after treatment initiation, with four bleeding complications between days 8 and 30. The predictive power of all five scores for bleeding was poor (c-statistics 0.57–0.64), both for the three-level and two-level score outcomes. No individual score was found to be superior. The HASBLED score had a good c-statistic for bleeding occurring after the first week of treatment (0.75, 95 % CI 0.47 to 1.0). There are no studies deriving or validating an early bleeding risk score specifically for OP PE management. In the open-label, non-inferiority trial discussed in the previous section by Aujesky et al8 344 patients with acute PE and PESI risk class I or II were randomised to IP treatment or discharge from hospital within 24 hours after randomisation. Active bleeding and high risk of bleeding, including severe renal impairment, were important and relevant exclusion criteria. Also, 2 (1.2%) of 171 OPs and none of the IPs had major bleeding within 14 days (95% UCL 3.6%; p=0.31), suggesting in selected low-risk patients OP care was as safe as IP treatment. In a multicentre prospective randomised trial of home treatment (n=72; discharged at day 3 when transthoracic echocardiogram (TTE) excluded RV dysfunction or day 5) versus hospitalised therapy (n=60), the rates of clinically relevant bleeding were 5.5% in the early discharge group and 5% in the IP group (relative risk (RR) 1.11, 95% CI 0.26 to 4.77; p=0.60).1 The incidence of major bleeding was 1.4% in the early discharge group and 1.6% in the IP group for a RR of 0.83 (95% CI 0.05 to 13.05). The incidence of minor bleeding was 4.2% in the early discharge group and 3.3% in the IPs with a RR of 1.25 (95% CI 0.22 to 7.24). As the short-term mortality was 2.8% (95% CI 0.8% to 9.6%) in the early discharge group compared with 0% in the standard hospitalisation group, the study was suspended. One death was due to GI haemorrhage at day 5. The criteria to select patients for this study were not validated. A meta-analysis of RCTs and prospective or retrospective cohort studies looked at low-risk patients assessed by a variety of risk factors (many used a variation of Hestia criteria) and their pooled incidence of major bleeding.10 The pooled incidence of major bleeding was 0.97% (95% CI 0.58% to 1.6%) in OPs, 0.78% (95% CI 0.16% to 3.73%) in early discharge patients (<72 hours) and 1% (95% CI 0.39% to 2.8%) in IPs. Piran et al performed a systematic review and pooled meta-analysis of three RCTs and eight prospective cohort studies examining OP versus early discharge (1–3 days).11 Also, 5 of 11 studies used risk stratification models (eg. PESI and Uresandi) and the remainder used clinical gestalt. The rates of major bleeding and fatal intracranial haemorrhage were 0.81% (95% CI 0.37% to 1.42%; I2: 0%) and 0.29% (95% CI 0.06% to 0.68%; I2: 0%), respectively. The pooled rate of major bleeding for patients stratified using clinical gestalt was 0.62% (95% CI 0.059% to 1.79%; I2: 14.7%) compared with 0.94% (95% CI 0.4% to 1.8%; I2: 25%) for patients identified using a risk stratification model. The short-term (<14 days) pooled risk of major bleeding was 0.46% (95% CI 0.022% to 1.46%; I2: 30%). Independent of the risk stratification method used, the risk of major bleeding was low. None of these studies assessed the bleeding risk in patients treated with non-vitamin-dependent DOACs. The risk of bleeding with these agents is discussed later. Risk stratification using a validated scoring tool, together with clinical exclusion criteria, can identify patients who are suitable for OP management; approximately 1%–2% of this cohort will undergo a complicated clinical course. Additional markers of PE severity may further reduce this risk, although potentially at the cost of reducing the number of patients suitable for OP management with only minimal further risk reduction. Further measurements may also add to time and cost. Agterof et al13 prospectively studied 351 haemodynamically stable patients with acute PE. One hundred and fifty-two patients (43%) had both an absence of exclusion criteria and NT-proBNP <500 pg/mL and were discharged <24 hours following PE diagnosis. No deaths, recurrent VTE or major bleeding up to 3 months were observed. Klok et al43 had earlier performed a meta-analysis of six studies (n=543) of NT-proBNP and seven studies (n=589) of BNP in acute PE. Elevated levels of both BNP and NT-proBNP were associated with worse outcomes (combined 30-day mortality OR 7.6 (3.4–17)). In a more recent study, patients who met the Hestia criteria for OP management of PE were randomised to direct discharge or NT-proBNP testing; those with elevated NT-proBNP were admitted for IP management.31 The study confirmed that patients meeting the Hestia criteria had low rates of adverse outcomes and failed to show an additional benefit of NT-proBNP testing, possibly due to low numbers of patients with elevated NT-proBNP levels. Jimenez et al44 studied the utility of standard cardiac troponin I (cTnI) in identifying high-risk and low-risk patients in a cohort of 318 patients with non-massive acute PE. Jimenez et al45 subsequently performed a meta-analysis of all available studies of standard cTnI and standard cardiac troponin T (cTnT). Both studies concluded that standard cardiac troponins did not, on their own, adequately distinguish between normotensive patients at low or high risk of deterioration. Moore et al46 subsequently studied both standard cTnT and PESI in 567 patients with acute PE and observed that low-risk PESI (I/II) had a higher NPV and negative likelihood ratio (NLR) than a negative standard cTnT (<0.1 ng/mL). Thirty-four per cent were classified as low risk by PESI alone but the addition of cTnI reduced this proportion to 26%. Furthermore, the addition of cTnT to PESI did not significantly improve the NPV or NLR to predict mortality at 30 days. The introduction of hsTnI and hsTnT has provided a potentially superior method of identifying patients with extremely low levels of myocardial ischaemia and, hence, increase the ability to detect those at risk of early deterioration. Lankeit et al47 performed a prospective multicentre study of 526 normotensive patients and assessed both sPESI and hsTnT. Two patients (1%) with sPESI 0 and four patients (2%) with hsTnT <14 pg/mL had complicated outcomes compared with zero patients with both sPESI 0 and hsTnT <14 pg/mL, suggesting that the combination of hsTnT and sPESI may be superior to either parameter alone. Twenty-four per cent of the study population had both an sPESI of 0 and an hsTnT <14 pg/mL. Ozsu et al48 prospectively assessed sPESI, standard cTnT and hsTnT in 121 normotensive patients and observed that hsTnT was superior to standard cTnT in identifying low-risk and high-risk patients. As the NPV of an sPESI of 0 was 100% in this cohort, the addition of hSTnT to sPESI did not improve identification of very low-risk patients. Hakemi et al49 performed a retrospective, single-centre study of 298 consecutive admissions with PE. No patients with hsTnI <0.012 ng/mL died or required thrombolysis or cardiopulmonary resuscitation. Eighty-nine (30%) patients had both an hsTnI <0.012 ng/mL and a PESI of I or II; these patients were at lower risk of requiring admission to the intensive care unit or inferior vena cava filter insertion. However, the exact NPV is not clear. No studies have specifically assessed the additional information supplied by echocardiography in addition to clinical risk score. Jimenez et al50 studied 214 haemodynamically stable patients. Although the NPV of a normal echocardiographic examination for 30-day mortality was high (98%), the positive predictive value was only 5%. Furthermore, the NLR was 0.71, leading the authors to conclude that echocardiography added little value to clinical criteria in identifying low-risk or high-risk patients. A meta-analysis by Coutance et al51 identified eight studies assessing echocardiography (n=1249) and also calculated a suboptimal NLR of 0.62, suggesting that echocardiography has limited use in identifying low-risk patients suitable for early discharge. Becattini et al52 performed a meta-analysis of 4767 normotensive and hypotensive patients from 27 studies which investigated the ratio of RV to LV diameter on CT. Patients were subsequently grouped as positive or negative for RV dilatation based on CT findings only, typically based on an RV/LV cut-off ratio of 0.9 or 1. The NPV for 30-day all-cause mortality was 95% and for PE-related mortality 99%. The authors therefore suggested that lack of RV dilatation on CT may have utility in identifying patients suitable for OP treatment. However, in a prospective multicentre study of 848 normotensive patients, Jimenez et al53 observed no difference in 30-day all-cause mortality between patients with and without RV dilatation on CT (4.7% vs 4.3%; p=0.93). In this study, the two independent prognostic predictors identified were standard cTnI and BNP. Zondag et al37 performed further analysis of the Hestia data and investigated 496 patients with CT data. No adverse events were observed in the 275 patients treated at home on the basis of their Hestia criteria. Thirty-five per cent of this group had RV dilatation on CT, suggesting that the Hestia criteria were superior to CT assessment of RV dilatation in identifying low-risk patients. Several other parameters have been identified as potentially useful in identifying patients with PE at higher risk of mortality. However, limited data exist to support routine use of these parameters in helping to identify patients at very low risk. Shopp et al recently performed a meta-analysis of 10 studies of ECG in acute PE, involving 3007 patients. Six ECG parameters were associated with poorer 30-day outcome: heart rate >100 beats/min, S1Q3T3, complete RBBB, inverted T waves in V1–V4, ST elevation in aVR and atrial fibrillation.41 The Daniel score (a 21-point scoring system) was significantly lower in those patients without 30-day haemodynamic collapse (mean 2.6±1.5 cf. 5.9±3.9). There was, however, no comparison of the Daniel score with PE clinical risk scores or other biomarkers. Jimenez et al54 performed bilateral leg compression ultrasonography in 707 consecutive patients diagnosed with acute PE. The presence of DVT was associated with increased all-cause mortality (adjusted HR 1.66 (1.28 to 2.15)). Aujesky et al55 studied 366 patients diagnosed with acute PE. Increased d-dimer levels were associated with poorer 3-month all-cause mortality; however, this association was not independent of PESI. Vanni et al identified elevated plasma lactate levels (≥2 mmol/L) as being an independent predictor of 7-day PE-related mortality or haemodynamic collapse.56 These findings are all in need of external validation and as yet have not been shown to offer any additional benefit for stratification of very low-risk patients. Jimenez et al57 studied derivation and validation cohorts of 848 and 529 haemodynamically stable patients in a multicentre prospective study. The four independent prognostic predictors for a complicated course identified were standard cTnI, BNP, presence of DVT on USS and sPESI >0, with echocardiographic assessment of the RV not providing additional prognostically beneficial information. In patients with sPESI of 0, BNP above and below 100 pg/mL was associated with a risk of 30-day complicated course of 3.1% and 0.9%, respectively, suggesting addition of BNP to sPESI could further refine risk stratification; however, mortality was zero in both groups. Vuilleumier et al58 subsequently studied 230 elderly patients (>65 years) with non-severe acute PE. In this study, both NT-proBNP (threshold 300 pg/mL) and hsTropT (threshold 14 pg/mL) had NPVs for a 30-day combined end point of PE-related death, recurrent VTE or major haemorrhage of >95% and outperformed PESI which was not predictive of the primary end point. The addition of hsTropT to PESI or Geneva Prognosis Score improved the AUC for the primary end point at ROC analysis; however, no combination of biomarker and clinical score could demonstrate a higher NPV than NT-proBNP alone (98.6%). The authors conclude that NT-proBNP or hsTropT could be adequate alternatives to clinical risk scores in elderly patients and that the addition of hsTropT may improve the efficacy of clinical risk scores. Limitations of this study include a high exclusion rate due to missing data and the incorporation of major haemorrhage in the primary end point, which makes comparison with other studies difficult. Patients who are suitable for OP management, in terms of both sPESI of 0 or PESI I/II and lack of exclusion criteria but who have had some degree of RV dysfunction demonstrated radiologically (most often on CTPA), present a common clinical dilemma. Data from four studies previously discussed above are of use in guiding an approach to this clinical problem.46 48 52 56 In their multimodality prognostic study, Jimenez et al57 defined 214 patients as very low risk in terms of an sPESI of 0 and a low BNP. No 30-day complications were observed in the 12 patients (6%) in this subgroup who had evidence of RV dysfunction on echocardiography. In their study of hsTnT and sPESI in 526 normotensive patients, Lankeit et al47 demonstrated RV dysfunction in 35% of the 456 patients who had undergone echocardiography. One hundred and twenty-seven patients had both sPESI of 0 and hsTnT <14 pg/mL, and none of these patients had an adverse 30-day outcome. Also, 113 of this subgroup had undergone echocardiography, with RV dysfunction being present in 17 (15%). In the study of hsTnI by Hakemi et al,49 137 of 298 patients were hsTnI-negative (<0.012 ng/mL). None of the hsTnI-negative subgroup died or required cardiopulmonary resuscitation or thrombolysis; 6%–8% of this subgroup had evidence of RV dysfunction on CTPA or echocardiography. In the study by Jimenez et al of RV dilatation on CTPA, an enlarged RV was observed in 533/844 patients (63%) of whom 252 (47%) had a BNP <100 pg/mL.53 Although exact details regarding outcomes in patients with RV dilatation and normal BNP were not provided, as a 30-day complicated course was observed in only ≈4% (n=19) of all patients with a normal BNP then one can conclude that only a very small proportion of patients with RV dilatation and normal BNP levels had a complicated course. Various validated risk prediction models suggest that a substantial proportion of patients could be managed as an OP for PE provided they are assessed as low risk and have a favourable clinical and social profile. Most of these risk models have been developed to predict 30-day mortality rather than select patients for OP management. The proportion identified as suitable depends on the selection process employed. The Geneva criteria seem to identify the largest proportion of patients as low risk compared with the other validated risk prediction tools; however, there is a consequent increase in adverse events. The Hestia criteria were designed specifically to guide selection for OP management and are the best validated of the clinical exclusion criteria in the published English-language literature but all of the clinical prediction tools seem to be able to identify a patient population at low risk of adverse events. PESI is the most extensively validated clinical prediction tool, although studies suggest that sPESI is almost equivalent and it is easier to derive. PESI and sPESI have the advantage over Hestia of not excluding pregnant patients and not including the potentially ambiguous criterion of medical or social reason for treatment in hospital. On the other hand, PESI and sPESI exclude those with active cancer. These differences highlight grey areas and the need for experienced review. Furthermore, these risk scoring strategies have been validated against 30-day outcome measures. These provide reassurance regarding the longer-term risk of an OP management strategy, but this time point clearly extends beyond the expected duration of an IP admission. Potentially, scores looking at shorter-term outcomes may be more relevant to early management strategies, including decisions regarding OP management. While abnormal RV function may be of relevance in the assessment of higher-risk patients,5 the absence of radiological RV dysfunction cannot be used to predict an even lower risk of deterioration. There is evidence to suggest that the addition of cardiac biomarkers (BNP, NT-proBNP, hsTnI or hsTnT) may identify patients at even lower risk of a complicated course (0%–1%) but this reduction in likelihood of clinical deterioration is likely to be at the expense of a reduction in the proportion of patients suitable for discharge to approximately 20%–30% and may also require extra resources. Laboratory cardiac biomarkers may have a role in predicting a low risk of a complicated course in patients who, despite a low-risk clinical score and the absence of exclusion criteria, have radiological or echocardiographic evidence of RV dysfunction. It is not an infrequent occurrence that troponin is requested as part of a general bundle on admission. In this context, a positive result should be treated in accordance with local trust policy and, in particular, causes for elevation other than pulmonary embolism should be considered. An algorithm for the OP management of PE is provided in figure 1A (when applying Hestia criteria) and figure 1B (when applying PESI or sPESI). (A, B) Algorithm for the outpatient management of PE (A, Hestia; B, Pulmonary Embolism Severity Index (PESI) or simplified PESI (sPESI)). *If imaging cannot be undertaken same day, then patients may be considered for empirical treatment with either low molecular weight heparin or apixaban or rivaroxaban and asked to return within 24 hours for definitive diagnosis, providing they fulfil the remainder of the criteria for outpatient management. †Patients with cancer or those who are pregnant or within 6 weeks post partum may be considered for outpatient management.NICE, National Institute for Health and Care Excellence; NT-proBNP, N-terminal B-type natriuretic peptide. PESI is the most validated but sPESI may be easier to use and is just as powerful in identifying low-risk patients. Haemodynamic instability (HR >110; SBP <100 mm Hg; requirement for inotropes and critical care; requirement for thrombolysis or embolectomy). Active bleeding or risk of major bleeding (eg, recent GI bleed or surgery, previous intracranial bleeding, uncontrolled hypertension). Severe pain (eg, requiring opiates). Chronic kidney disease (CKD) stage 4 or 5 (eGFR <30 mL/min) or severe liver disease. HIT within the last year and where there is no alternative to repeating heparin treatment. Prospective randomised comparison of (s)PESI against Hestia rules out criteria to determine proportion of patients who can be managed as OPs, including safety outcome. One study is currently running which will address this issue (NCT02811237). The majority of evidence in the literature regarding the management of PE relates to confirmed PE, rather than suspected PE. However, as ambulatory care services have evolved, they have had to consider the clinical scenario in which an individual with a suspected, but not radiologically confirmed, PE could potentially be investigated/managed on an OP basis. There is a sparser evidence base on which to make recommendations in this area. The evidence for managing patients with suspected PE is based on two observational cohort studies which look at differently selected populations.12 59 These studies used inclusion and exclusion criteria designed to remove patients with potential haemodynamic, radiological or biochemical markers of adverse outcomes for PE, or had medical, social or practical barriers to OP investigation. One study, based in the emergency department, aimed to validate an algorithm for the diagnosis of PE in a selected group of patients presenting with pleuritic chest pain.59Among 408 patients classified as intermediate or high risk of PE (as judged by a combination of Wells score and d-dimer testing) who underwent imaging, there was a low rate of diagnosed PE (5.4%). 86.5% were investigated as OPs with 274 patients (67.2%) having PE diagnosed or excluded within one working day. An additional 79 patients (19.4%) underwent OP imaging. All patients received a dose of LMWH pending imaging. Follow-up was for 3 months with significant complications defined as death or a recurrent venous thromboembolic event. Across all those recruited to the study, three patients had a recurrent venous thromboembolic event within the 3-month follow-up period and there were four deaths, one of which was attributed to PE. All those investigated as an OP had an ‘uncomplicated recovery’. A retrospective review of outcomes from an established OP PE service assessed 905 patients referred with suspected PE of whom 562 were considered at intermediate or high risk for PE and underwent imaging following a dose of LMWH.12 Same-day imaging was performed in 62.8%, with 89% undergoing imaging the same or next day. The maximum time to imaging was 5 days. Eleven per cent (96/905) had a confirmed PE with 70 managed as OPs. There were no deaths or complications related to PE in the follow-up period for those managed as OPs. Finally, a single-centre audit of an OP care pathway for patients with suspected PE discharged from the emergency department pending imaging has been reported.60 A series of clinical exclusion criteria were applied and patients were treated with LMWH before returning for imaging within 24 hours. A total of 45 patients were managed in the OP setting, with 25% subsequently confirmed to have a PE. There were no adverse events or readmissions in any patients on this pathway. There have been no published studies which specifically look at the role of direct oral anticoagulants in patients with suspected PE but this topic is covered in further detail in the next section. For 40 years, the standard therapy for most patients with PE has been the administration of heparin, overlapped and followed by a VKA.3 Recently developed oral anticoagulants that are directed against factor Xa or IIa (thrombin), collectively termed DOACs, overcome some limitations of standard therapy, including the need for heparin injections in some cases and for regular dose adjustments on the basis of laboratory monitoring.61 Because of their rapid onset of action, the DOACs have the potential to enable single oral drug regimens, which can replace parenteral anticoagulants and warfarin. Both apixaban and rivaroxaban have licences to be used as a single-drug approach, whereas dabigatran and edoxaban require a lead-in period of treatment with heparin. There are no studies comparing the use of DOACs against LMWH/VKA or fondaparinux in the OP setting. There is now strong evidence that DOACs are non-inferior in the treatment of PE and have a favourable safety profile.62–65 A Cochrane review assessed the evidence for the effectiveness of DOACS in the treatment of PE.66 The five RCTs they examined are summarised in table 7. The Cochrane review66 concluded that there was no difference in the effectiveness of oral direct thrombin inhibitors (DTIs) and standard anticoagulation in preventing recurrent PE (OR 1.02, 95% CI 0.50 to 2.04), recurrent VTE (OR 0.93, 95% CI 0.52 to 1.66) and DVT (OR 0.79, 95% CI 0.29 to 2.13) or causing major bleeding (OR 0.50, 95% CI 0.15 to 1.68). The oral factor Xa inhibitors were no more or less effective in the prevention of recurrent VTE (OR 0.85, 95% CI 0.63 to 1.15), DVT (OR 0.72, 95% CI 0.39 to 1.32) and all-cause mortality (OR 1.16, 95% CI 0.79 to 1.70) or causing major bleeding (OR 0.97, 95% CI 0.59 to 1.62). Several large meta-analyses have been performed to assess the safety of DOACs in different conditions.61 67 68 Sardar et al analysed 50 trials involving 155 537 patients treated with DOACs for a variety of indications.68 Pooled analysis of all DOACs for all indications did not show a significant difference between DOACs and comparators for risk of major bleeding (OR 0.93, 95% CI 0.79 to 1.09). For the treatment of acute VTE or PE, DOACs were associated with significantly less bleeding (RR 0.63, 95%CI 0.44 to 0.90). Gómez-Outes et al analysed 10 studies in 35 019 randomised patients with VTE, of whom 14 364 were treated for PE.61 They reported a lower risk of clinically relevant bleeding in those treated with a DOAC (RR 0.72; 95% CI 0.57 to 0.91) and noted there was evidence of statistical heterogeneity across the studies (table 8). The advantage of DOACs in an OP setting is that they are administered orally rather than parenterally. It is worth noting that the designs of the DOAC studies differ and only rivaroxaban and apixaban have been studied as single-drug regimens for the treatment of PE without the need for an LMWH lead-in period, although patients could receive a dose of heparin prior to diagnosis.63 64 In the RE-COVER (dabigatran)62 and Hokusai-VTE (edoxaban)65 studies, LMWH was also administered for at least 5 days. In the EINSTEIN DVT and PE studies, a cohort of 649 patients received rivaroxaban without prior treatment with heparin.70 A retrospective post-hoc analysis, comparing this cohort to those who did receive heparin (n=3501), concluded that the use of prestudy heparin did not influence the efficacy and safety of rivaroxaban in patients treated for symptomatic VTE as there were no differences in terms of recurrent VTE or major bleeding. Single-dose DOAC regimens offer the advantage of a faster time to reach therapeutic anticoagulation, which is attained after the first dose, in contrast to traditional VKAs which require at least 5 days of bridging with a parenteral anticoagulant and an INR >2 before the desired anticoagulation is achieved. Therefore, these regimens have the potential to reduce LOS and/or facilitate early discharge. Van Bellen et al reviewed the length of initial hospitalisation in patients presenting with either symptomatic DVT or PE using hospitalisation records from the EINSTEIN-DVT and PE trials.73 Overall, 90% (4328/4821) of EINSTEIN PE patients were admitted to hospital. The proportion of hospitalised patients with a LOS of five or fewer days receiving rivaroxaban was 45% compared with 33% for enoxaparin/VKA in patients with PE. Stays of 6–10 days were observed in 39% of rivaroxaban-treated patients compared with 46% of enoxaparin/VKA-treated patients for PE. LOS was significantly shorter in the rivaroxaban group compared with the enoxaparin/VKA group across all analyses performed (p <0.0001). As this was an international study, there were very significant variations in the observed admission rates and LOS. A post-hoc analysis of hospitalisation and LOS in the North American subset of patients from the EINSTEIN study evaluated LOS using investigator records of dates of admission and discharge.74 Of 382 patients hospitalised, 321 (84%) had acute symptomatic PE; few patients with DVT required hospitalisation. Similar rates of patients with VTE were hospitalised in the rivaroxaban and enoxaparin/VKA treatment groups, 189/405 (47%) and 193/401 (48%), respectively. In hospitalised patients with VTE, rivaroxaban treatment produced a 1.6-day mean reduction in LOS (median = 1 day) compared with enoxaparin/VKA (mean = 4.5 vs 6.1; median = 3 vs 4). This was primarily driven by the 1.7-day mean reduction in hospital LOS for patients with PE treated with rivaroxaban (n = 162) versus enoxaparin/VKA (n = 159; mean = 4.5 vs 6.2; median = 3 vs 4; p = 0.0002). Another post-hoc analysis was undertaken in the Japanese cohort of the EINSTEIN DVT and PE studies which examined the length of hospital stay in patients with PE and/or DVT receiving rivaroxaban compared with Japanese standard therapy.75 In Japan, the standard of care for the treatment of PE and/or DVT consists of intravenous unfractionated heparin followed by warfarin. Analyses were conducted in the intention-to-treat population of 97 participants. The median LOS in rivaroxaban patients was 10 days compared with 15 days for patients on standard therapy (p=0.016). The limitations of the study include a non-standard dose of rivaroxaban 15 mg twice daily for 21 days followed by 15 mg once daily, the small sample size and the generalisability of the findings to a UK setting. A multicentre, retrospective, observational cohort study of 158 patients, admitted with a primary discharge diagnosis of PE, compared 82 patients treated with enoxaparin and warfarin and 76 treated with rivaroxaban.76 The median LOS was 2.7 days shorter for those treated with rivaroxaban (1.8 days (IQR 1.2 to 3.7) vs 4.5 days (IQR 2.7 to 5.9) enoxaparin plus warfarin (p<0.001)). The time from initial dose of anticoagulant to time of discharge was also significant; the median interval in the warfarin plus enoxaparin group was 3.9 days while the median interval was 0.9 days in the rivaroxaban group (p<0.001). This study has limitations as there may be confounding factors for clinicians choosing one regimen over another. Masotti et al retrospectively analysed data on patients discharged with PE from five hospitals in the Florence district, Italy, over a 4-year period.77 They found that mean and median LOS in patients on DOACs was significantly lower than in patients on other anticoagulant treatments. Using a single DOAC in a pathway is preferred to minimise potential confusion over dosing and administration. With the advent of DOACs, patients may be considered early for discharge rather than once therapeutic anticoagulation has been achieved with VKAs. Tools and strategies can assist clinical judgement in when it may be appropriate to discharge patients. Only one study was identified as suitable for inclusion in this section which was conducted in Spain. Moores et al78 performed a retrospective cohort study of 304 patients who were classified at the time of diagnosis into PESI class III (intermediate risk). Seventy-seven per cent were aged >65 years. They recalculated the PESI again at 48 hours following diagnosis (PESI-48) and reclassified the patients accordingly. They also calculated the sPESI at 48 hours (sPESI-48) and stratified patients as low risk (score 0) or high risk (score ≥1). The authors compared the outcomes (all-cause mortality days 2–30, recurrent VTE and major bleeding) in those patients who were reclassified as low risk (PESI-48 class I or II or sPESI-48 score 0) with those who remained high risk. The PESI-48 score reclassified 27.3% (83/304) (95% CI 22.3% to 32.3%) as low risk. This was predominantly due to changes in physiological parameters such as heart rate, SBP, temperature, respiratory rate or oxygen saturation. Mortality at 30 days in the low-risk PESI-48 group was 1.2% (95% CI 0% to 3.5%) versus 8.3% (95% CI 4.5% to 12.1%) in those who remained PESI class III. Five per cent of patients were reclassified as high risk (class IV or V) when the PESI-48 score was recalculated and in this subgroup 30-day mortality was 50% (95% CI 25.5% to 74.5%). sPESI was retrospectively calculated at admission and 250 (82%) patients were deemed to be high risk at this point. Recalculation of sPESI-48 in these 250 was subsequently reclassified 15.2% as low risk. Mortality at 30 days was 0% in the low-risk sPESI-48 group compared with 12.3% (95% CI 7.8% to 16.7%) in those who remained high risk. Adverse events were similar in both PESI-48 and sPESI-48 groups (2.4% (95% CI 0% to 5.7%) and 4.8% (95% CI 0.2% to 9.3%), respectively). There was no evidence in the literature to help determine the optimal seniority of staff assessment required within OP care pathways. The guideline group reviewed the statement produced by the Royal College of Emergency Medicine on consultant sign-off for non-traumatic chest pain and conditions of similar risk. This stated that where patients could not be reviewed by an emergency medicine consultant, that they should be reviewed by a senior trainee in emergency medicine (ST4 or above) or by a staff grade or similar substantive career grade doctor with sufficient emergency department experience to be designated to undertake this role by the emergency medicine consultant medical staff. Due to greater experience in the medical specialties from core medical training prior to entry into the specialist trainee grade in acute and specialist medicine, compared with emergency medicine, the group felt that ST3 and above would provide an adequate level of seniority within these specialties, which could be applied to OP management of PE.79 The group also felt that advanced nurse practitioners or clinical nurse specialists could be trained and designated to undertake this role with consultant support. Finally, the group concluded that the clinical review should also formally take in to consideration alternative diagnoses in the case of suspected PE. If patients are on an OP pathway for suspected PE and being considered for discharge and scanning the following day, a local protocol should be in place to guide a full cardiorespiratory assessment to exclude other causes for symptoms (including full history, examination, ECG and chest radiograph), including risk assessment. In all of the studies detailed below, follow-up arrangements were a fixed part of the study protocols and as such were not designed to address the question of how best to follow-up patients; thus, recommendations are extrapolated from assessment of procedural safety within OP studies. The majority of these studies are performed as service evaluations, although one OP protocol within a RCT has also been evaluated. Only aspects specific to an OP management strategy are discussed. Agterof et al studied 152 prospective patients with normal NT-proBNP levels.13 Patients received written instructions regarding readmission, if specific symptoms or signs should develop, and a 24-hour emergency contact number. They were also contacted by telephone on days 2 and 4 and were clinically reviewed on day 10. No deaths, major bleeding or recurrence episodes occurred within the first 10 days. Seven (4.6%) patients required hospitalisation within the first 10 days, although over half of these (4/7) were deemed unrelated to the diagnosis of PE. The remaining three cases were admitted for further review as suspected complications of PE but underwent no additional procedures or changes in anticoagulant therapy. All three were discharged safely after a stay of 2–5 days. In a later study, Zondag et al prospectively enrolled and ambulated 247 patients with proven PE and no prespecified exclusion criteria.36 Patients were reviewed as an OP on day 7 and received a telephone contact at 6 weeks. No patients died during the first week of follow-up but two patients had died (deemed unrelated to PE) within the first 30 days. At 3 months, a single patient had suffered a major bleeding episode and VTE recurrence had been detected in five patients. In two retrospective cohort studies, similar patients were followed up by daily phone calls and had access to a 24/7 helpline.80 81 No adverse events were reported within these cohorts, although it should be noted that all patients had an average IP stay initially of 3–4 days. A further recent prospective service evaluation described immediate discharge from the emergency department on diagnosis of PE, with telephone follow-up after 1–2 days followed by formal clinic review at 3 weeks.71 No adverse events (recurrence or major bleeding episodes) were described in this cohort during the treatment period. Of note, these patients were discharged and maintained on a DOAC rather than VKA. Two additional prospective cohort studies describing experience within an OP assessment clinic for the work-up of suspected PE did not provide clear details regarding the follow-up procedure.12 59 Within all studies, OP anticoagulation was managed either by a primary care physician or dedicated anticoagulant clinic. No evidence was found suggesting a clinical benefit from regular platelet count monitoring in patients discharged with a diagnosis of acute PE. In addition, the national British Committee for Standards in Haematology guidance has recently clarified the lack of benefit of routine platelet count monitoring for medical patients prescribed heparin.82 It should be noted that the same guidance suggests an initial baseline platelet count in all patients receiving heparin. Follow-up of PE should be performed by clinicians with a special interest in VTE. Further studies evaluating the role of technology for remote monitoring, such as virtual consultations and data gathering, are needed. Every woman should be risk assessed for VTE in early pregnancy and again if admitted or during any intercurrent illness.90 Therefore, those presenting with suspected PE but not subsequently confirmed should be risk assessed to ensure they are offered prophylactic LMWH (not DOACs, see below) if they fulfil the Royal College of Obstetricians and Gynaecologists (RCOG) criteria. Updated guidelines for the acute management of VTE in pregnancy have recently been published by the RCOG. These recommend against the use of d-dimer testing and pre-test probability assessment in pregnancy.91 They also highlight that DOACs are likely to cross the placenta and should be avoided in the antenatal period. No specific evidence was found regarding the OP management of pregnant or postpartum women with suspected or confirmed PE or DVT. Given that pregnancy is associated with a physiological fall in blood pressure, a rise in heart rate, a subjective feeling of breathlessness in many (as well as a reduction in PCO2 and increase in PO2), PESI and sPESI are likely to overestimate the risk to the pregnant woman. In studies using the Hestia criteria, pregnancy was itself an exclusion to OP management. In the literature, there is no consensus regarding OP management of PE in pregnancy or the puerperium. Pregnant and postpartum women should not be excluded from OP care pathways. Clear communication between the medical, haematological and obstetric teams with documentation regarding follow-up and responsibility for ongoing investigation and care is imperative. Outpatient care pathways may be considered for suspected or confirmed PE in pregnancy and/or the postpartum period. DOACs or VKAs should not be used in pregnant patients with suspected or proven PE. Studies addressing the safety and efficacy of OP care pathways for pregnant and postpartum patients with suspected or confirmed PE are needed. In the majority of patients with cancer, the application of recognised scoring systems for mortality risk, including PESI and sPESI, will result in patients falling into high-risk mortality groups, although this may be related to non-PE-related mortality. Since PESI and sPESI were not specifically designed as tools to risk-stratify patients for OP management, this necessitates an alternative approach to selecting patients for OP management with active cancer. One study developed a score from an internal derivation and validation cohort of pateints with cancer and acute PE from the RIETE registry which was then validated in 261 patients in an external cohort; the score included six variables: age >80 years, heart rate ≥110/min, SBP <100 mm Hg, bodyweight <60 kg, recent immobility and presence of metastases.97Thirty-day mortality in the low-risk cohort (score=0, 22.2% of patients) was 4.4% compared with 29.9% in the high-risk group and the the external validation cohort, 30-day mortallity was 0% in the low-risk group. This score has not been applied prospectively in OP management of patients with cancer-associated PE. Alternative scoring systems specifically for use in patients with cancer, such as the POMPE-C score,98 99 require further validation. Across all studies, 686 patients with underlying malignancy and PE were included. In total, 306 patients with malignancy and diagnosed PE were managed as OPs or with early discharge. Study heterogeneity, including time to discharge, treatment regimens and follow-up period, together with the absence of results specifically relating to patients with cancer in population-level studies, are significant limitations in the available evidence. Thus, it is difficult to comment on the safety of OP management of diagnosed PE in patients with cancer. Treatment regimens included LMWH/warfarin or LMWH alone, reflecting the year of study publication. There is currently no published evidence to support the use of DOACs over LMWH in patients with cancer. Study sites included North America and Western Europe (Italy, Spain and the Netherlands). No studies from the UK were identified. Further studies are needed to validate risk stratification tools specific to patients with cancer. There have been no published studies which specifically look at the information and support needs of patients being investigated for PE. Evidence for the information and support needs of patients with PE is based on one retrospective observational cohort study from the USA.80 The study investigators speculated that many uninsured patients with VTE lacked sufficient disease and treatment information and lacked surveillance and timely access to medical care following hospitalisation. They hypothesised that, through (1) targeted education of patients and providers, (2) coordination of timely follow-up for at-risk patients and (3) posthospital monitoring, they could achieve standardised care for all acute DVT and low-risk patients with PE. As a result, the aims were to decrease hospital LOS and produce fewer return visits and readmissions. A total of 241 patients entered the VTE clinical care pathway: 107 with DVT (44.4%) and 134 with a PE (55.6%). Within the pathway, uninsured patients with VTE were admitted at a lower rate than insured patients (65.9 vs 79.1%; p=0.032). LOS decreased from 4.4 to 3.1 days (p<0.001) for admitted patients with VTE and from 5.9 to 3.1 days among uninsured patients (p=0.0006). The rate of emergency department revisits at 30 days was 11% but declined from 17.9% to 13.6% in patients without health insurance (p=0.593). Fewer patients treated within the pathway were readmitted (5.8%) compared with historical patients (9.4%, p=0.254). Healthcare costs were significantly decreased. By implementing an interdisciplinary, clinical pathway and standardised care for patients with VTE, the authors demonstrated significant reductions in health resource utilisation and cost, particularly among uninsured patients. This supports a model for improving transitional care coordination with local community health clinics and delivering care to vulnerable populations. Studies addressing the safety and efficacy of outpatient care pathways for pregnant and postpartum patients with suspected or confirmed PE are needed. The British Thoracic Society and the Guideline Group members are particularly grateful to Dr Rodney Hughes and Dr Matthew Fay who contributed to the early work of the guideline group; the BTS Standards of Care Committee. NICE. Venous thromboembolic diseases: the management of venous thromboembolic diseases and the role of thrombophilia testing, 2012. CG144 2012.
. Antithrombotic Therapy for VTE Disease: CHEST guideline and expert panel report. Chest 2016;149:315–52.
. Prospective validation of the Pulmonary Embolism Severity Index A clinical prognostic model for pulmonary embolism. Thrombosis and Haemostasis 2008;100:943–8.
. Identification of low-risk patients with acute symptomatic pulmonary embolism for outpatient therapy. Ann Am Thorac Soc 2015;12:1122–9.
. Findings From 12-lead Electrocardiography That Predict Circulatory Shock From Pulmonary Embolism: Systematic Review and Meta-analysis. Acad Emerg Med 2015;22:1127–37.
. Oral direct thrombin inhibitors or oral factor Xa inhibitors for the treatment of pulmonary embolism. Cochrane Database Syst Rev 2015;4:CD010957. Medicine RCoE. Clinical effectiveness committee standard: consultant sign-off, 2010. Cardiology ESo. Diagnosis and Management of Acute Pulmonary Embolism. Eur Heart J 2014. doi: 10.1093/eurheartj/ehu283 [Epub ahead of print].
. Saving Lives, Improving Mothers’ Care. Surveillance of maternal deaths in the UK 2012–14 and lessons learned to inform maternity care from the UK and Ireland Confidential Enquiries into Maternal Deaths and Morbidity 2009–14. Oxford: Maternal, Newborn and Infant Clinical Outcome Review Programme, National Perinatal Epidemiology Unit, University of Oxford, 2016.
. Venous thromboembolism in cancer patients in Christchurch, 1995-1999. The New Zealand medical journal 2002;115:257–60.
. Venous thromboembolism and cancer: risks and outcomes. Circulation 2003;107:17I-–21.
. Hestia criteria with the POMPE-C tool identifies patients with cancer and pulmonary embolism at very low risk for short-term complications. Journal of Thrombosis and Haemostasis 2013;11:864.
. Complications after intravenous drug abuse and the diagnostic value of color flow duplex scanning. Journal of Vascular Technology 1996;20:27–8. Competing interests All members of the Guideline Group made declarations of interest in line with BTS Policy and further details can be obtained on request from BTS. Guideline Development Group members are listed in appendix 1.